Fuel3D is discontinuing sales of the Scanify in all regions outside the US & Canada. As part of this process they have opted to make their Professional software free to use for all SCANIFY users. In addition, while stocks last customers in the US and Canada can get SCANIFY for a reduced rate of $799.99 + taxes, , until 11th August 2017. It’s important to note that Fuel3D will still honour all 1-year manufacturers’ warranties on products sold by authorised distributors before 11th August 2017. In addition, Fuel3D will support the SCANIFY product until 31st December 2017. 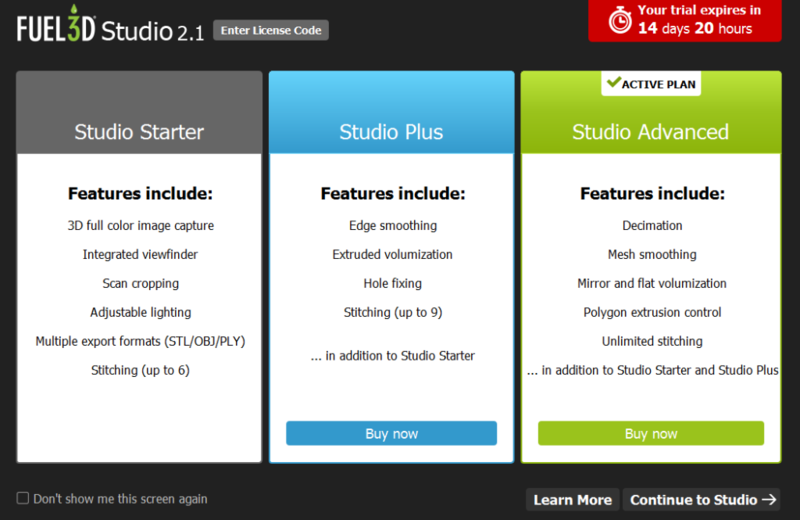 More info and the unlock code that can be used to upgrade Fuel3D Studio to Pro can be found here. 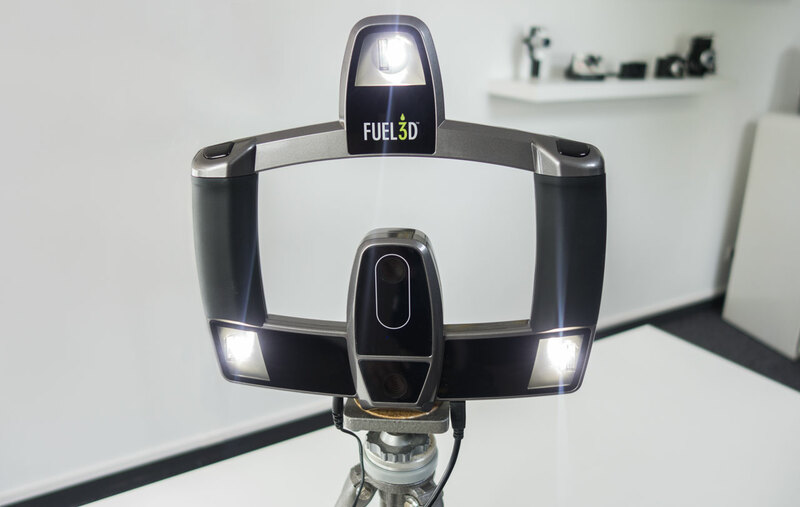 Fuel 3D is a UK-based manufacturer of 3D capturing technologies. If you keep an eye on the 3D market like I do, you might have read that the company recently received € 1.7 million EU Horizon 2020 funding to develop a 3D capture solution for eyewear. And just last month, it announced the CryoScan3D—an enterprise-level foot scanner specifically aimed at the orthotic market. What I’m reviewing here is their $1500 / €1200 (ex VAT) handheld 3D scanner launced in 2015—the Scanify—kindly provided to me by Beglian reseller KD85.com (thanks, Wim!). The Scanify is an interesting product, because it’s very different from other scanners. And although it’s marketed as an allround 3D scanner, it’s only usable for a few specific purposes. But it does so in an impressive way. Right from the start when browsing through the Scanify website it’s clear that the company has a large emphasis on design. The green-and-grey branding is everywhere, as is the “fire up your creativity” mantra. The devices comes in a very green box with Apple-ish attention to detail. It contains the device itself, a power adapter with every thinkable wall socket add-on, a USB cable, Quick Start Guide and tree target discs—more about those later. In the background you can see a small selection of my vintage camera collection. I used to actively use them as a hobby, but now I’m only doing digital photography. The lights you see are the LED Guide Lights. Next to each is a Xenon flash. In the white outline in the center there’s an RGB camera. Another is located in the bottom-center part under a slight angle. According to the specs, they’re both 3.5 megapixel cameras. You can see the power cord and USB cable sticking out of the bottom. This is where the Scanify differs from other 3D scanners: it has no lasers or a projector that beams infrared (like the Sense and Structure Sensor) or visible light (like the Einscan-S) patterns. Instead of relying on these depth-sensing technologies, it uses photogrammetry algorithms to distill depth information from multiple photos, all taken within a second. This is the same technology used in software only reality capture applications and mobile 3D scanning apps. So to someone like me that has done a lot of both photography and 3D scanning, the Scanify sits in between a digital photo camera and a handheld 3D scanner capable of capturing objects from all sides in a continuous motion. The advantage of this is speed: capturing a single 3D image is done in a split-second. This doesn’t require the subject to keep still. 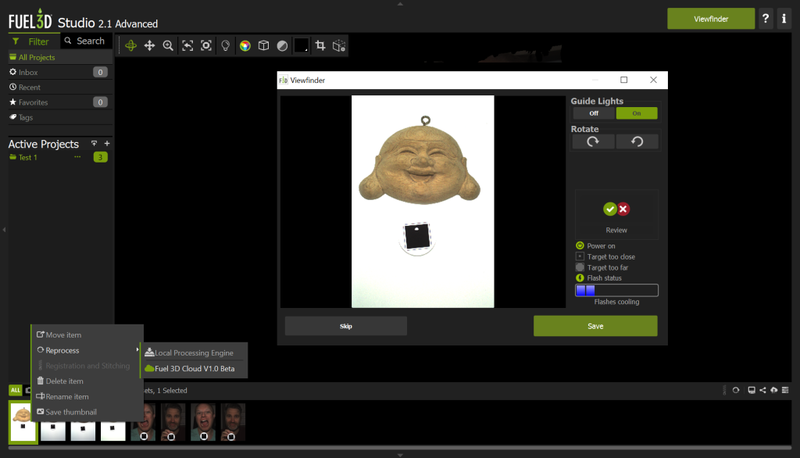 Another advantage is that photogrammetry usually delivers higher-quality 3D geometry than entry-level 3D scanners. Connection-wise it’s plain simple: plug the power supply into a wall socket and the USB cable into a computer—in my case a Macbook Pro Retina with i7 processor, running Windows 10 through Boot Camp. More about the software in a bit. What is missing from in the box are holders for the target discs—which are present on the photos on the product website. Fuel 3D does offer models of a handheld holder and a 45° stand, but the fact that buyers have to 3D print these themselves—like I did—is a weird contrast for such a polished device. I don’t thinks its main audience is 3D printer owners to begin with. Studio Plus is €44.99 (ex VAT) per year and Studio Advanced €89.99. Whether or not you need the paid features will mainly depend on your choice to use other software to edit the meshes or prefer a single-software workflow. And if you want to be able to stitch together a lot of captures into a single model, which I will show you later. Either way, these prices are fair and not a breaking point for professionals in my opinion, as long as Fuel 3D keeps actively developing and improving the studio software. Which it does, because there will be a Mac version this year—something many creative professionals like myself will like. This review is based on my experience with the 30-day trial of Studio Advanced, which is full-featured except for a limit of the total amount of cloud rendering jobs you can submit. Enough to decide if it’s worth the price. 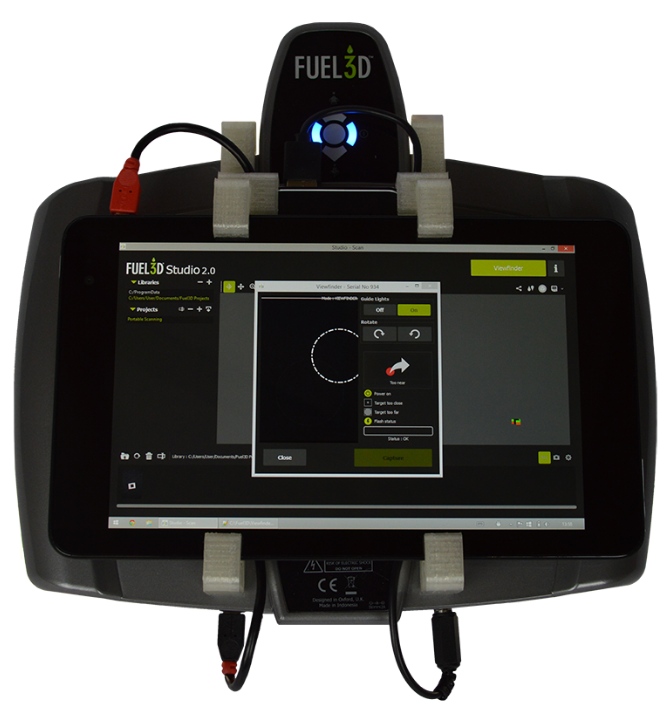 The user interface of Fuel 3D Studio is well designed in the signature green-grey color scheme. It’s as much a capturing as a project management tool: everything you do can be organized in projects in the left sidebar. On top of that you can add tags to captures to find them later or mark things as favorites. The thumbnails in the bottom drawer are the captures in the selected project. Here you can rename them and reprocess them—either locally or through the cloud. The small icons in the bottom right are for exporting (as .STL .OBJ or .PLY) or sharing directly to the popular 3D showcasing website Sketchfab. Personally I think these icons are a bit small and in an awkward place. If you would want to use this software on a Windows tablet—more about that later—it will be hard to comfortably tap them. 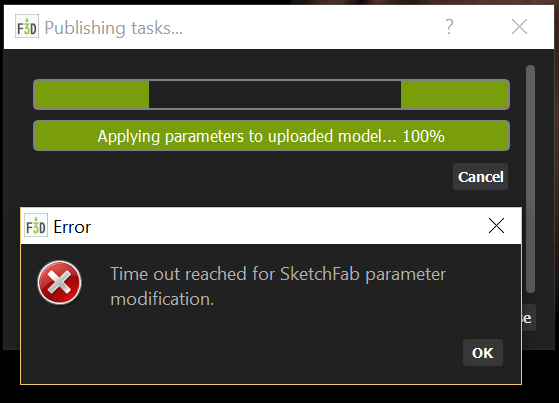 Although I always got this error when exporting to Sketchfab, the uploads were complete and usable. The big green Viewfinder button launches the pop-up you see above (with the Buddha). The guide lights can be switched off, but the flashes are alway on. This is because the flashes appear to be simultaneous but are actually sequential and photos are taken with the light coming from different angles to help the photogrammetry algorithm achieve the highest level of detail. The flashes need a cool-down period of around 15 seconds before you can take the next shot, which isn’t long, but can be inconvenient for making captures from different angles for stitching. While not very ergonomic, it’s possible to hold the Scanify in landscape mode, but you have to manually rotate the viewport. The viewfinder window detects the target disc and will display a green circle around it when you’re at the right distance. This is between 30 and 40 cm. Combined with the narrow field of view of the cameras, this is the main limiter of the practical use of the Scanify. The maximum size of objects that can be captured is about the size of a sheet of A4 or letter paper. The wooden Buddha hanger is 16 cm wide from ear to ear. Target Detection can be a bit jittery and isn’t always perfect. It also loses a detected target a bit too easily. There are blue LED indicators on the back of the device, but since you really have to look at the computer screen to frame the picture, these are rather useless. A viewfinder would have been handy—even an analogue one. Keep in mind that you also have to place the target disc somewhere. This way the textures are brighter and more natural, but there’s a catch. If you select the MatCap Render option in the two embeds above, you can clearly see that the first capture has a lot more geometric detail. The wrinkles and definition in Buddha’s face are way better. So while some extra lights do improve texture quality, they counteract the way the flashes are used to let the algorithm determine depth (probably relying on comparing hard shadows). 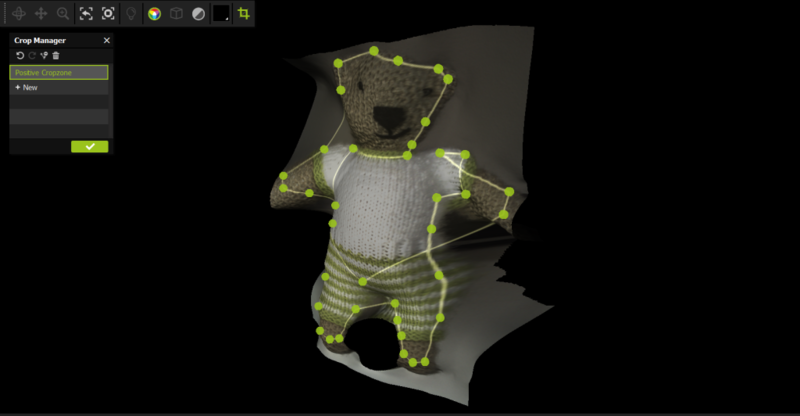 If you set both embeds in MatCap render mode, you can see that the geometry of the knitting pattern on the bear has finer details with the Scanify. This proves that Fuel 3D’s flash-based algorithm is one of a kind and indeed capable of capturing impressive 3D geometry within a fraction of a second. There’s, however, a big difference between the Scanify’s approach and every other photogrammetry method—or depth-sensor-based 3D Scanners. The others are all designed to generate 3D data by capturing a subject from a wide range of angles, all the way up to 360 degrees. This way they can differentiate between the subject and the background, and separate them. The Scanify results always contain the background. The Teddy Bear was shot standing in front of a white wall, so the geometry on the edges is weirdly stretched. There’s no way to automatically remove backgrounds in Fuel 3D Studio, so you’ll have to use the manual Cropping Tool. This allows you to create multiple positive or negative cropzones. The selection mechanism automatically connects the points you set to create a shape. This works fine for most simple shapes, but I had quite a few occasions where the selection became a bit of a mess. 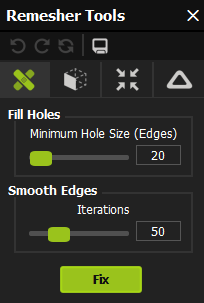 If you do need more geometric details on the sides of your object, the Fuel 3D Studio has a feature to stitch together multiple (6 in the free version and 9 and unlimited in the Plus and Advances paid versions respectively) captures into a single 3D object. 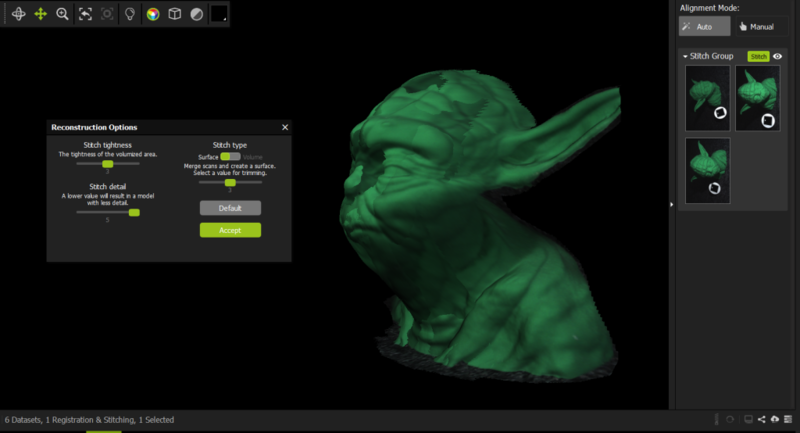 This process is semi-automated and to show you how it works I turned to my 3D printed Yoda bust. 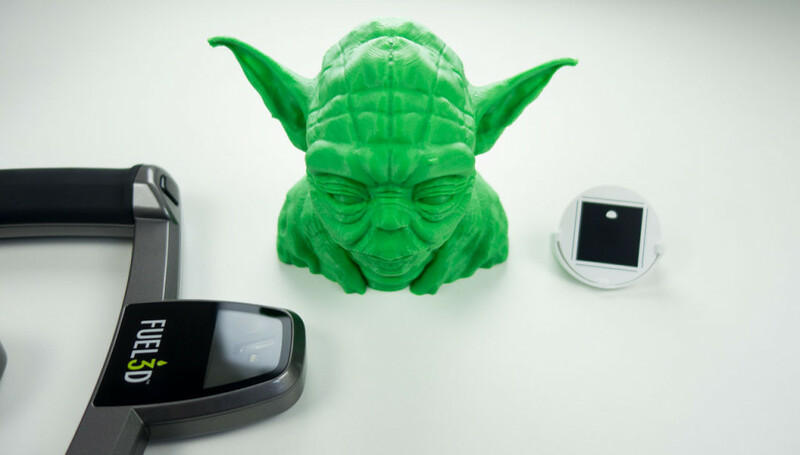 Both the Yoda Bust and and the Target Disk Stand were 3D Printed with the ZYYX 3D Printer I reviewed earlier. After cropping, you have to add the captures to a so called Scan Pool, so the software knows they belong together. 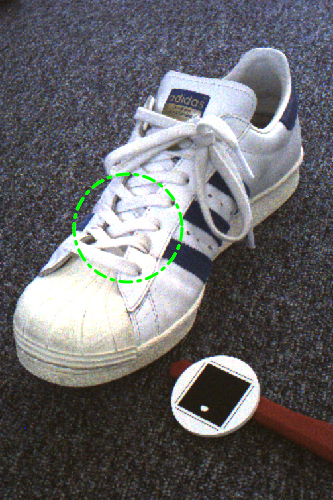 Here you can also put them in the right order to help the stitching algorithm. In the next step, you have to add the captures to a Stitch Group, from which you can start the automated stitching procedure by clicking the green Stitch button. This works in two phases. In-between you can set some preferences, like you can see in the screenshot below. I’ll be honest about this feature: it sort of works and the result is better than I expected. But it’s not perfect: the top part of Yoda’s face is fused okay, but his neck clearly isn’t. This could be a result of the way I cropped the images. And it probably needs a lot more overlapping captures for this angle of almost 180 degrees. But realistically speaking I found the manual part of this procedure very tedious. I wouldn’t want to do this for 6, 9 or an unlimited amount of photos. Especially when there are software and hardware-based solutions that do the whole process automatically. Honestly, I expected a higher resolution texture map from a device that has two 3.5 megapixel cameras. The texture maps exported with the .OBJ are simply a single photograph (in old-skool .BMP format) of 768 x 512 pixels—a little under just 0.4 megapixels. I’m not sure why the texture is so low-res: the algorithm clearly uses higher-res images to get the geometric detail. There’s a work-around to increase the texture quality by shooting a separate high-res photo and aligning that with the texture image (which isn’t warped in any way) as explained in this example from Scanify user Marc Wakefield. But it would be a lot easier if Fuel 3D makes it possible to export the full 3.5 megapixels of the camera for the texture map. That being said, the big upside is the geometric detail! I can really look at the MatCap render mode and think: “How did this happen in a fraction of a second?” I must emphasize that all examples here are done with the cloud rendering option—the locally processed results are simply unusable in most cases. The cloud rendering is pretty fast, too—just a few minutes. And I’m very sure that this cloud algorithm will improve vastly over time, since it was introduced only a few months ago. It’s a pity that the geometric quality is only present on the planes that face the camera straight-on. The sides of noses, for example, are simply stretched geometry and texture. And even though the Scanify has two cameras, it didn’t capture Patrick’s nostrils (he has them, I checked). Theoretically, you could make two more captures from the sides, like I did with Yoda, but the cool-down period of the flashes prevents you from doing this fast enough for the person to keep still. Another noticable artefact is the rendering of eyes. The only reflective part of the human face looks very Terminator-ish, probably because of the reflections of the harsh flashes. Pupils are also strangely extruded. The Mirror Surface Type is exactly what you think it is: a face on either side (if you have small children and often wish you had this second pair of eyes in the back of your head… now you don’t anymore—it’s scary). Again, I can totally see the use for this in the eyewear industry, especially tailored (sun)glasses. But for that I think the ears are a necessity. The Scanify is also great for capturing fine textures in small objects, so I can also imagine its use in archeology (fossils) and forensics (footprints). Fuel 3D also sells Press-and-Scan Compound that can be used to create scannable imprints of objects that are otherwise impossible to scan: like reflective, metal objects. But there’s a problem for any use of the Scanify outside: it’s not portable. I wanted to scan some tree bark outside, but the fact that is has to be connected to a wall socket for power prevents this. But it’s not completely impossible. In fact, because the Scanify draws just 2A of electricity, you can power it with a decent USB power bank. Fuel 3D even sells a special Mobile Package with a short USB-to-power-port and USB-to-microUSB cable. This set could be used to take the Scanify outside with a laptop. Better even, you could also 3D Print a pair of mounts for a Dell Venue 8 Pro Windows tablet (you can get one for as low as $250) and go completely mobile. Image courtesy of Fuel 3D. Although I’m not sure how well an underpowered tablet will handle the high-poly 3D objects and must admit that this approach feels a bit hack-and-slash for a product that’s otherwise very polished, I actually think everyone who buys a Scanify should also get the tablet and and do this mod. If only used for capturing on the go, it will give a great amount of freedom to the product that really makes it a 3D Camera. The Cloud Rendering option is great in this scenario, if only it could be set as a default and prevent the local rendering from happening automatically as it would drain the tablet’s battery. It would be nice if the whole mobile contraption would fit into the Neoprene Soft Case that Fuel 3D sells for a reasonable price, but judging the images this isn’t the case (no pun intended). Created in Maxon Cinema 4D. 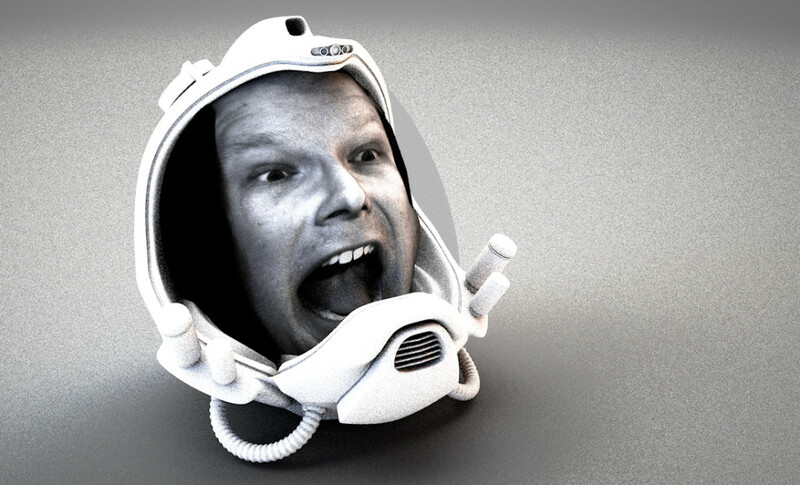 Space Helmet model courtesy of Tristan Gruet / The Pixel Lab. Printed on the ZYYX 3D Printer with ColorFabb Natural PLA/PHA on 200 micron. I would love to hear any other creative possibilities in the comments! Let’s start with the fact that for $1500 / €1200 (ex VAT) the Scanify is affordable to any professional that has a specific purpose for it. Even adding a few hundred extra to get the complete Mobility Package with the Dell Tablet and Battery Pack so you can make a dedicated ready-to-shoot device out of it is probably worth a professional’s money. But you do have to have a very specific purpose for this device. 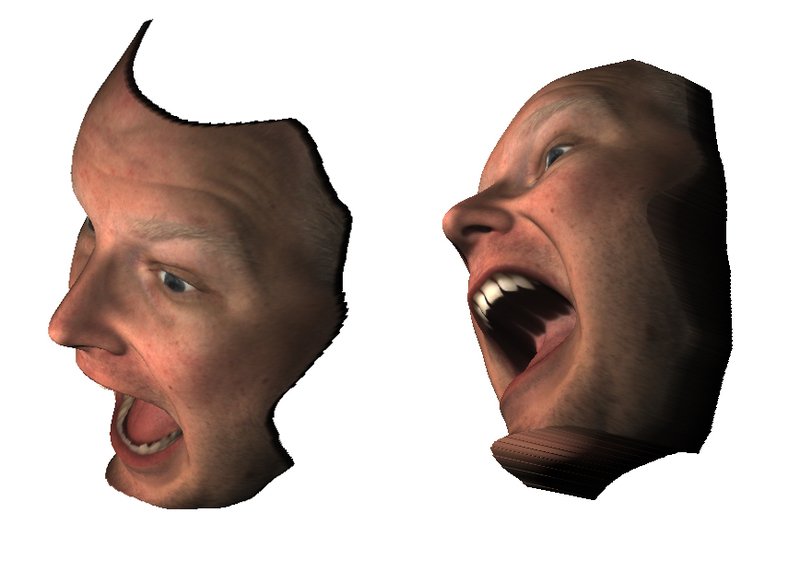 If you want to make full 360-degrees 3D scans, the Scanify is not for you. You can do it occasionally if you have loads of time and patience, but the scanner is actually more appealing to people that don’t. 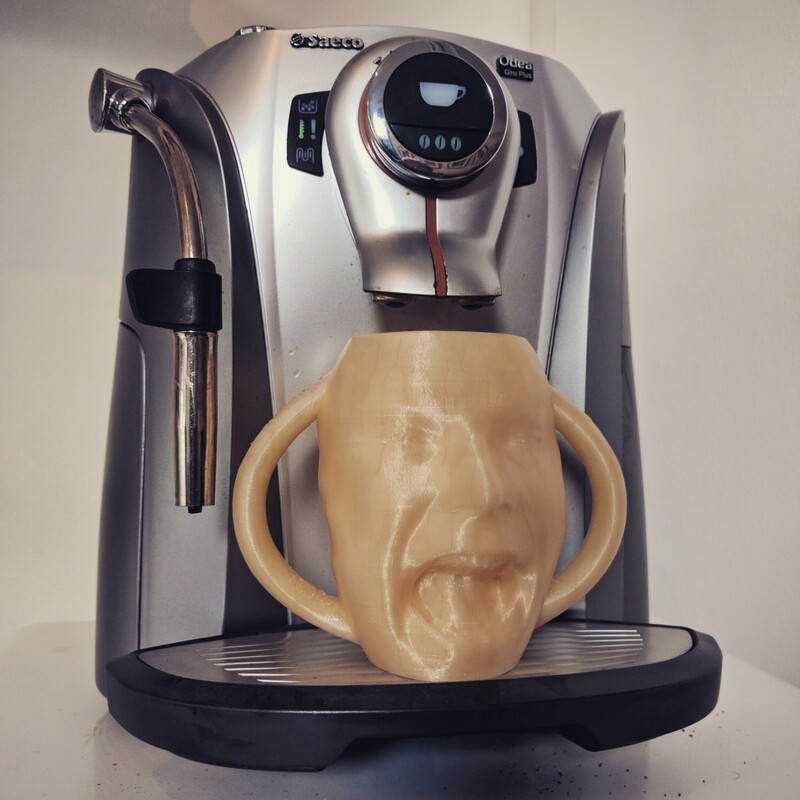 If you want to capture 3D geometry in a snap-second of shallow, textured objects that are not bigger than a sheet of office paper, the Scanify can generate impressive results. Remember this product just a year old and the software has had a great amount of updates since its release—in particular the great cloud rendering feature. My biggest wishes for the product would be high-resolution texture maps and some kind of automatic background removal. I would have no problem with shooting objects in front of a green screen for this. Finally, I’m no fan of markers in general and I wish the Scanify could work without the discs. If Fuel 3D would add face detection for portraits to determine the ideal distance, maybe it can could drop the targets for that purpose and make face scanning even faster. I’ll keep following Fuel 3D’s developments, because I’m very curious to how they will use this technology in future products. Hopefully, they’ll also keep making affordable hardware next to their industrial products. As always, I hope you enjoyed reading this post. If you have any questions, please drop a line in the comments or send me a Tweet. And if you think this article is useful for your friends and followers, I’d appreciate it if you share it by using the buttons below. I am trying to build myself (and my soon too) into the “3D”. So, I am as green as it can get. Appreciate your opinion on whether Fuel 3D Scanify is the right scanner to start with and whether there are other “things” I should consider: i.e. software, various books,…. At this stage, flexibility would be the attribute I would appreciate the most (I thought that a handheld / portable scanner would fall into this category). Would you recommend some other scanning device? Of course, not exceeding the price of the Scanify. Or, maybe you would recommend forgetting the 3D scanner at this stage and going directly for the 3D printing? As I am living in Egypt, getting such equipment delivered into the country is not a very straight forward process. I want to take advantage of a coming travel to finalize this. It all depends on what you want to capture! If you want to 3D capture stuff while traveling or simply on a budget, you can start with Photogrammetry first. Check out http://nl3d.co/123Dcatch and http://nl3d.co/ReCap360 which are both free for most purposes. 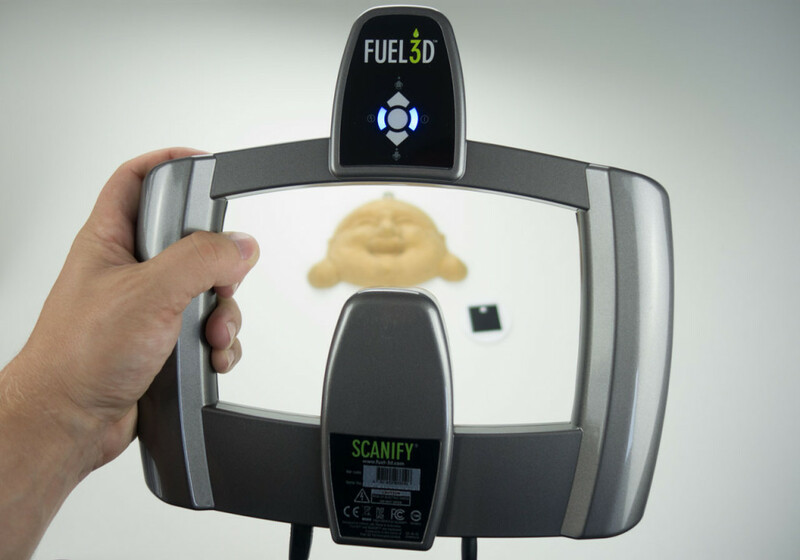 I’ve been using the Fuel 3d scanner for a few months now. I purchased it for the promises from the marketing, but was very disappointed with the actual product results (more a high resolution embossing). After a lot of time and experimentation I did manage to incorporate it into my production and I was using the Advanced version of the Fuel3D studio at 49 pounds per month as I needed to extrude my models and doing it in the same software was much easier. I also attempted a few 360 degree scans (something that they advertise you can do), but to get anything even beginning to look right you need more than 6 scans, (at least 3 on each side plus 3 around the top) which means you have to pay for the advanced version. Last week Fuel 3D introduced the latest version of their Studio software, and they also changed the pricing quite significantly. 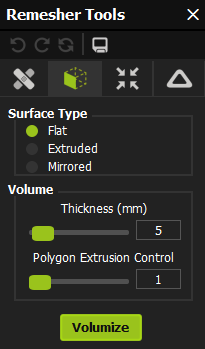 Now, the advanced version (allows to stitch more than 6 scan, necessary for 360 degree scans, smoothing and extruding) costs 132 pounds a month (US$190) for what I would consider basic and necessary to the use of the scanner. To use the software for a year costs 1,400 pounds (around US$1900). This is for the second tier Studio software package. The third, the professional version is even more. To buy the software out right costs US$5600. I live in Australia and our dollar recently lost parity with the US$ and for me to buy the software outright costs almost AU$7500. The Professional version is just under AU$10,000). So I’ve bought a US$1500 scanner and now they have increased the price of the software so that it is unfeasibly expensive to use (I also use Skanect which has more functionality and costs a little more than 1% of the Studio Software but can’t use the fuel scanner). As far as mobility is concerned, they have now removed the 32 bit version of the software which means that you no longer can use it on a tablet. It can however now be used on Apple products. I contacted them for an explanation of the 300% price hike on the 1st tier but they haven’t gotten back to me. The functionality in the Advanced version (which is the first tier, Professional being the even more expensive 2nd tier subscription) should be part of the basic package, but now we have to pay the costs of the scanner PER YEAR in order to use it. It is ridiculous, I feel ripped off that I have bought this hardware and now they are effectively ripping the buyers off by charging them a ridiculous amount for the software that one could easily argue is basic functionality and should be part of the hardware package. I can understand why you are looking at the Scanify. That might be a great one for this kind of subject, because it’s the only “scanner” I know that captures a small 3D image within a second. All other scanners need the subject to be totally still which is probably impossible with babies. I did capture my hand with it back when I did the Scanify review, by the way: https://skfb.ly/PNOn If you click the gear icon in the bottom right corner and set the Rendering to MatCap, you can see the geometric detail it captured. Keep in mind that you need to have the tracker in place. Maybe you can make that into a bracelet for the newborn? I can think of some other options that are worth experimenting with. If you’re interested please send me an email at nick[at]3dscanexpert.com and I can make a quote for a tailored advice. Thanks very much for the fantastic review. I found it very useful. I am planning for a 3D research project to analyse patients faces before and after surgical procedure. I found this scanner by accedent and it’s price sounds resonable for a pilot study. My worries are about the mesh density which should be at lease 0.1 mm and also the accuracy in reproducing patients faces. Another concern is about texture, if i am stitching multiple scans, does the final image keeps the texture after stitching. One last question, do they still charge the monthly fees for the software? I also appreciate if you can recommend other scanners in case this one does not satisfy my project requirements. 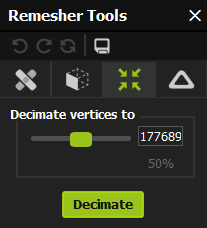 As far as I know the Scanify has been discontinued. See note at the top of the review. It will be nice to use this software with others 3d scanners.. is it possible ? I hope they free the software.. now it is free! I took out my old scan, I wanted to turn it on, but I did not find the drivers. the site is no longer working (I saw the note above =)), maybe you know what to do? As I am thinking to buy a new scanner this information is really very helpful to me. You have shared all the ideas very clearly here.